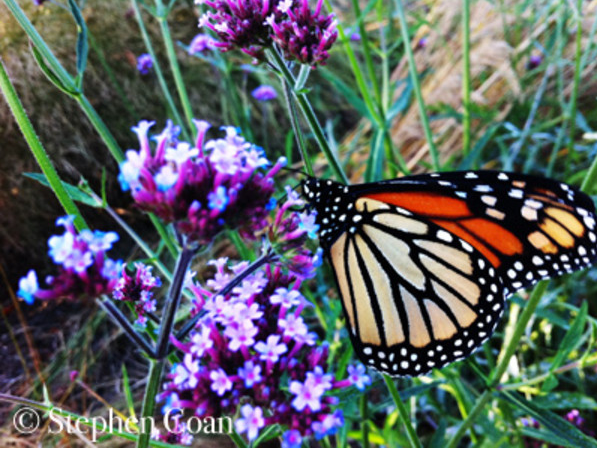 Monarch Butterfly drinking the nectar of Verbena. 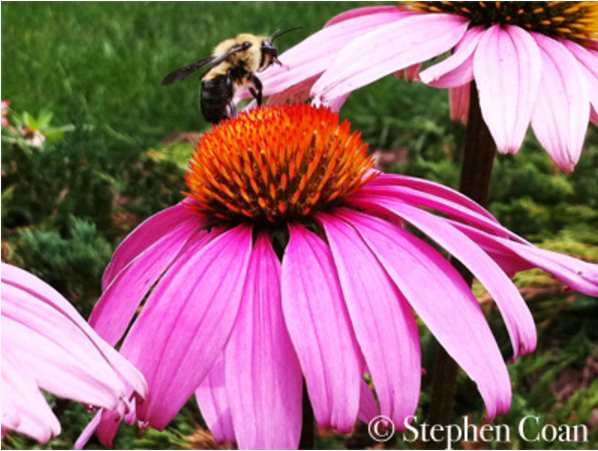 Bumble Bee feeding on Echinacea. Hello South Jersey, I don't know about your way of thinking but I like to design gardens that attract pollinators–butterflies, bees, hummingbirds, etc. In doing so we help the plant, insect and animal worlds and create a sustainable environment for them to live and grow and for us to enjoy. Most flowers and plants need to be pollinated by bees and butterflies, in order to reproduce, survive, or produce their fruit, vegetables, and future flowers. Over the years we, man, have reduced the amount of natural areas through development leaving less and less diversity and habitat for the birds and the bees to live in. I like to provide a diversity of native and pollinating plants that look great and are good for nature. Two recent studies of the dangerous worldwide decline of bee population were published Thursday in the journal Science. They link the use of a common type of pesticide class known as neonicotinoids, used on our food supply crops, to the decline in bee population. "Virtually all corn grown in the United States is treated with them," according to the studies. The studies found that crops requiring the use of bees to pollinate them, i.e. bees feeding on their nectar, are harmful to the bees due to the chemicals being present in the nectar and then causing harm to the bee. This worldwide decline in bee population could have some significant repercussions for us if left unchecked. For more information ﻿click here. I'm planning on putting in a few bee hives myself just to help the area flower and plant communities. I myself have noticed a large decline in the bee population on my own property over the last 10 years. I do not use pesticides, instead choosing to use natural means of control. Most bees will not harm you if left alone, meaning don't swat at them. They'll just fly around you briefly but are much more interested in the next nectar-bearing flower. Think of it. How would you react if someone swatted at you? 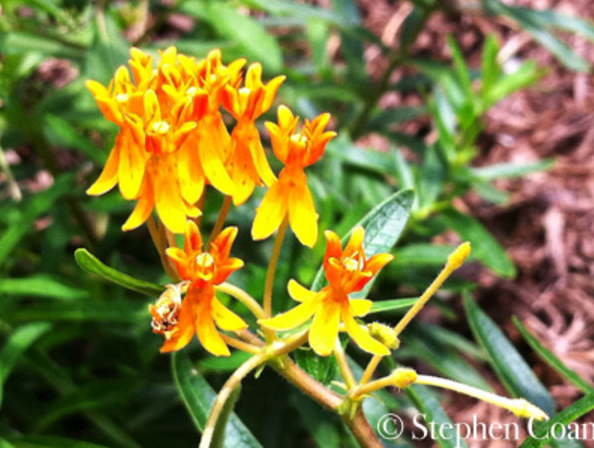 One of my favorite native perennial plants to use is Butterfly Weed, Asclepias tuberosa, zone 3 - 9, full sun, low maintenance, medium to dry conditions, 30" T x 18" W, does well in the tri-state area. It comes in a few different flower colors, orange, my favorite, yellow, and a bi-colored variety or two. The flowers attract butterflies, especially Monarchs and Queens, bees, hummingbirds and various other beneficial insects. If you are lucky you might find a Monarch Caterpillar feeding on it or my favorite yellow or orange aphids on it that eat the nectar which are then fed upon by larval ladybugs. To me this shows a well balanced garden habitat. Remember, most insects are good and not harmful to us like the bane of many people: the dreaded mosquito. Just make sure you don't have any standing water around your home for the mosquito to grow in, and a copious amount of bats that eat an astonishing number of them. For other info or inspiration take a look at my ﻿blog and ﻿website - Ferret Hollow Gardens. From my Patch Website Blog Posting.